Many years ago, people in Japan believed that a giant catfish lay deep underground, and that every time he moved he caused an earthquake. We know that this superstition continued for a long time, because after every major earthquake in the latter part of the Edo period (18th and first half of the 19th century), a wide variety of namazu-e woodblock prints were sold, all depicting some kind of relationship between catfish and seismic activity. So when was this connection between earthquakes and catfish first made, and how was it expressed? The earliest known written record linking catfish to earthquakes is a letter from Toyotomi Hideyoshi (1536-98), the unifier of Japan. Near the end of his life, he decided to build a castle in Kyoto's Fushimi district, and of course he wanted it to withstand any earthquake. In a letter to the Kyoto official in charge of administering and policing, he wrote, "During the construction of Fushimi Castle, be sure to implement all catfish countermeasures." His choice of words indicates that at least as early as 1592, when the letter was written, a connection was being drawn between seismic activity and catfish. O-jishin tsuzuite ryu-ya noboru ran. The first line is a short poem by Jishun, a student of Basho, describing powerful earthquakes as a dragon writhing his way up from the underworld. The second line, read by Tosei (Basho's nickname), jokes, "No, they are a giant catfish moving." Many woodblock prints illustrating the connection were printed around the middle of the 19th century. After a large quake hit Edo (present-day Tokyo) in 1855, artists published 200 to 300 different namazu-e prints of a satirical or witty nature, some apologizing on behalf of the catfish, some sold as charms to protect the owner from a future occurrence, some praising the fish for using the earthquake to change the world for the better. The association with earthquakes probably began long ago, when people saw catfish acting strangely before a quake. For example, a journal called Ansei Kenbunshi mentions that just before the Edo Earthquake of 1855, catfish became unusually active. 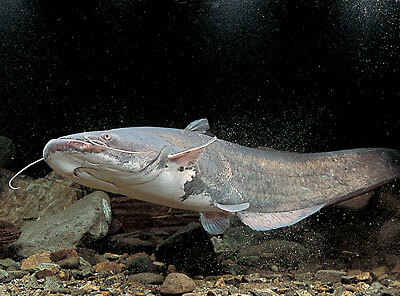 There is also a record of someone who went fishing for river eels but caught only catfish. He remembered the saying that an earthquake will strike after catfish do something strange, so he rushed home and prepared for the coming disaster. Sure enough, that night a major earthquake hit his area. A few days before the disastrous Tokyo Earthquake of 1923, catfish were seen splashing about at a pond in Mukojima, Tokyo. And the day before that same disaster, many catfish are reported to have acted erratically on the surface of a pond at Kugenuma, in nearby Kanagawa Prefecture. This made it easy to catch them  nough to fill three large buckets. These facts intrigued knowledgeable people, and gave them the idea of trying to predict an earthquake by keeping catfish and observing their behavior. But there is no scientific proof of a connection between catfish behavior and earthquakes. The fish generally stay at the bottom of ponds and shallow, muddy lakes, so it is likely that they can sense minute changes in electrical currents generated underground before a quake. This could account for their sudden bursts of activity at the water surface, but that is all that scientists can surmise at this time. Catfish are not the only creatures reported to behave strangely around the time of an earthquake. But no matter what discoveries are made in the future, it is most unlikely that one day catfish will be used as the best way to predict seismic activity.